A group of scientists from MSU, Frumkin Institute of Physical Chemistry and Electrochemistry of the Russian Academy of Sciences, and Juelich Research Center described the mechanism of appearance of an inertial lift force acting on finite-sized particles in microchannels. Such calculations were previously possible only for some specific cases. A more accurate description allows one to use this inertial lift for particle sorting. The study was published in Journal of Fluid Mechanics. The authors of the work studied the forces acting on the particles in microchannels. The behavior of the particles depends on the Reynolds number, which is the ratio of inertial to viscous forces within a liquid. At finite Reynolds number small particles migrate across the streamlines to some equilibrium positions in microchannels. This migration is attributed to the action of inertial lift forces. Precise calculations of particle migrations in microchannels will help to use them for sorting, e.g. separation of healthy cells from cancerous ones. Since there are several forces simultaneously acting on the particles, their migrations are difficult to interpret theoretically. Previous studies addressed only some simple specific cases, such as the migration of point-like particles, whose size is ignored, or finite-size particles translating in the vicinity of a single wall. "Inertial microfluidics is widely known and used, but so far only at high Reynolds numbers which is difficult to generate in microchannels since it requires a huge pressure drop to pump the liquid. Therefore modern devices for inertial particle separation employ quite wide channels," explained Evgeny Asmolov, a co-author of the work, senior research associate of Institute of Mechanics, MSU, and leading research associate of IPCE. The new study proposes a more general theory, which describes a hydrodynamic lift of finite-size particles in microchannels. Besides, the authors succeeded in accounting the particle-wall interaction and analyzing the behavior of particles with different density. 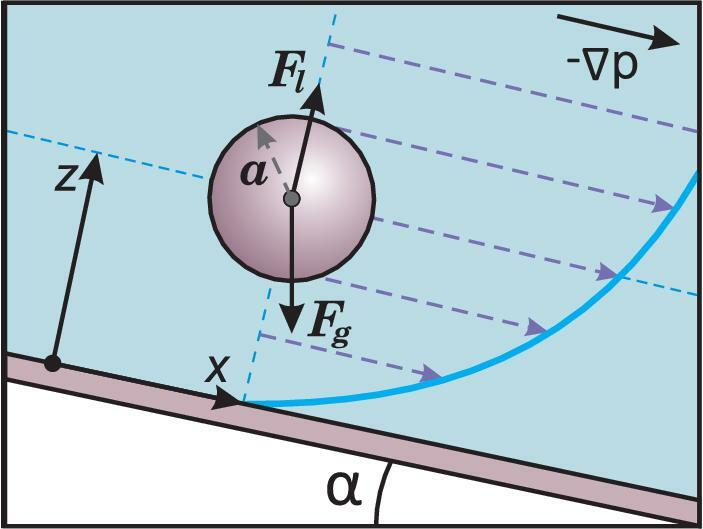 If the density of a particle differs from that of a liquid, the lift force will be balanced by gravity and the buoyant force. These two additional forces may shift the equilibrium positions or even cause their disappearance. The scientists validated the new theory by using computer simulations. According to their results, new formulae turn to obtained earlier in corresponding limiting cases. Moreover, the physicists analyzed several typical experimental settings to predict the behavior of particles. "According to our predictions, even at low (around ten) Reynolds numbers spherical particles can "take off", by rotating, from the walls of a microchannel, like planes. They then "fly" at certain distances from the walls, which depend only on their density and radius, by forming chains. Remarkably, the "flying altitudes" of such chains will be different even if sizes or densities of constituting them particles differ only slightly. These chains of particles can be easily separated in lab-on-a-chip devices, and the fractionation in this case is more efficient than in wide channels and at high Reynolds numbers," commented Olga Vinogradova, a co-author of the work, professor of the Faculty of Physics, MSU, and head of lab at IPCE.